Next in the series on Wayne's Jerky is this Hot variety. See my reviews of their Mild, Medium, and Teriyaki varieties. Beef, dextrose, salt, spices, sugar, butter flavoring, natural hickory smoke flavor, onion, garlic, monosodium glutamate, hydrolyzed soy protein, celery seed, caramel color, onion powder, garlic powder, cilantro, sodium nitrite. The first thing I taste from the surface of these pieces is a light smokiness, followed by a light saltiness, and then a light sweet. The chewing flavor starts with an increased saltiness, then immediately a garlic & onion seasoning. Some heat starts building up, while some meat flavors show up. For being labeled as "Hot", this jerky does offer a fair amount of heat, more so than the company's Medium variety I reviewed last week. On my personal hot scale, I'd put this at medium (level 3 out of 5), but still I think for general audiences it seems to hold up to its advertised flavor. But while this jerky has a good deal of heat, I'm not necessarily getting any kind of chile pepper flavor, or any other flavor that would make this hot. It's just a heavier burn without added flavor. If anything, the stronger heat might make the other flavorings a little less noticeable. This jerky seems to have a similar taste as the company's Mild and Medium varieties. It's largely a high degree of saltiness that comprises the bulk of this flavor, with a garlic & onion seasoning backing it up. I also pick up some black pepper. There are some meat flavors in this but tasting like cured meat, similar to what you'd find in summer sausage or a beef stick. The butter flavoring is also noticeable in this, giving it a more savory character. 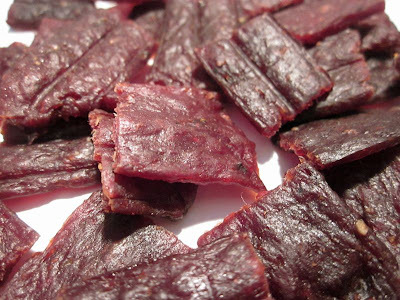 Overall, what you're going to notice in this jerky is a fair amount of heat, with a high degree of saltiness, a garlic & onion seasoning, and a buttery, cured meat flavor. This is a chopped & formed jerky, cut up into small, thin, bite sized pieces. These pieces are small enough that I find myself eating two or three at a time. 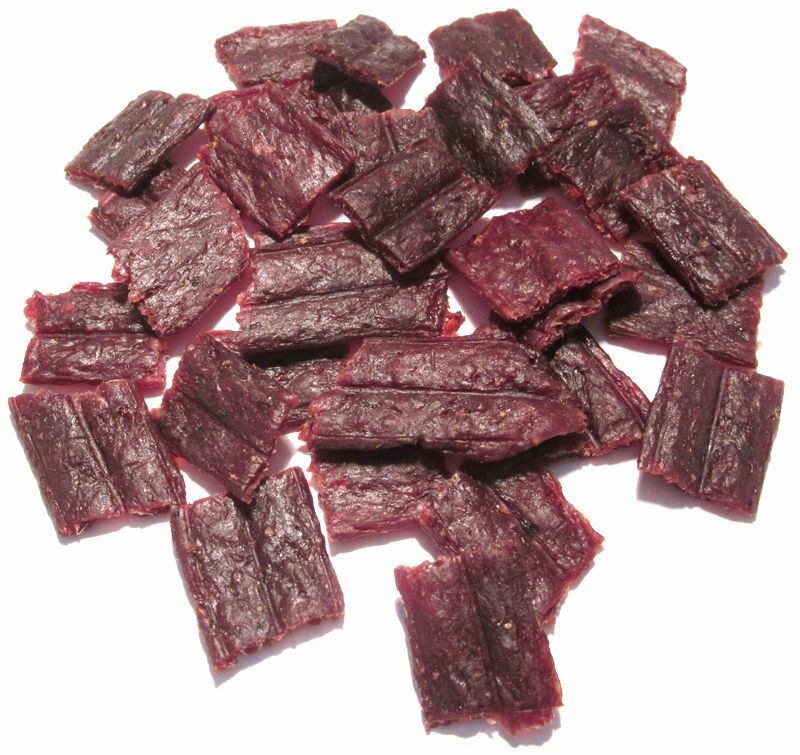 The chewing texture feels quite typical of a chopped & formed jerky, starting out with a fair amount of rubbery chewing resistance, and then chewing down to a crumbly feel. I can pick up some sense of this being meat, but largely it feels rubbery and crumbly. 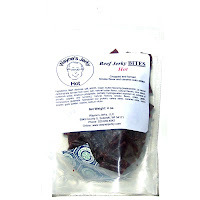 Wayne's Jerky sells this Hot variety from its website at a price of $6.95 for a 4oz package. According to their website, if you bought four packages the shipping comes out to $10.70 for a total of $38.50. That works out to $2.41 per ounce. For general jerky snacking purposes, at the $2.41 per ounce price, it seems to provide a fair value. I'm getting a good snackability for its overall great flavor, though with a rubbery/crumbly chewing texture. That price is considerably higher than what you'd pay for major brands of jerky in grocery stores, but I think you only get a little bit better snackability. As a Hot beef jerky, at the same $2.41 price per ounce, it's also a fair value. This jerky seems to a generate a decent amount of heat, enough that I think it warrants the "Hot" labeling. It provides more heat than the major brands of hot jerky, though at a higher price, but also with a better overall flavor. This Hot variety from Wayne's Jerky seems to hold up to being hot, at least for general purpose snacking anyways. I get a good deal of heat, though not enough to break a sweat on my scalp, but still a heavier burn than the company's Medium variety. But while it's a heavier burn, I'm not picking up any additional flavor. It's still pretty much the same flavor you get from Wayne's Mild and Medium varieties, mainly a high saltiness, a garlic & onion flavor, and a buttery cured meat flavor. If anything, the heavier burn might actually mask over some of the other flavorings. And it's also the same meat consistency, having a rubbery/crumbly texture that doesn't really feel too much like meat. Each piece has a fair amount of chewiness to it, but still overall easy to eat. However, I find each piece too small for a bite and end up eating two pieces at a time, which tends to make it more chewy, requiring a bit more labor to get through.